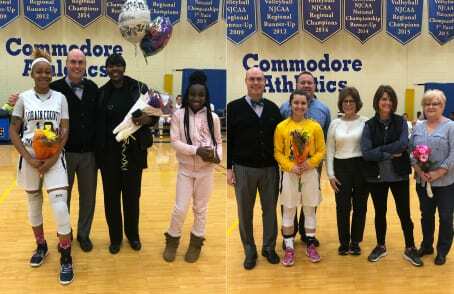 February 9, 2019 – – The Lady Commodores of Lorain County Community College beat the Eagles of Clark State Community College in wild 70-65 home win. With that win, the team now holds the 2nd most wins ever in a season for LCCC. The sophomore Lady Commodores, Tyeisha Sain (Bedford) and Hannah Oehlstrom (Avon Lake), were honored today after both playing in 50 games for LCCC. Ronnette Rahmon-Sumlin (North Olmsted) stole the show in the first half by stealing the ball from the Eagles. The Freshman recorded 13 first half points, 10 rebounds, and 3 steals. Marquita Thompson (Cleveland/John Marshall) was a force on defense, raking in 4 steals in the first half. LCCC had the lead 15-12 at the end of the first quarter. The second quarter was big for the Lady Commodores as they outscored the Eagles 22-13. Lorain grabbed a whopping 12 steals by the end of the first half; on pace for a season-high. Lorain commanded a 37-25 lead at halftime. Clark State came into the second half focused to start the 3rd quarter, dropping 21 points while holding Lorain to 10. Clark State’s shooting was much improved, while Lorain’s shooters struggled to find their rhythm. Lorain held a narrow 47-46 lead at the end of the 3rd quarter. There were several lead changes in the final quarter, but LCCC pulled away in final minutes, outscoring the Eagles 23-17. Four players landed in double digit scoring for Lorain, including Rahmon-Sumlin, Sain, Oehlstrom, and Bri Gallagher (Medina/Cloverleaf), leading the team to a strong finish in the final quarter versus the Division II school. Rahmon-Sumlin led the Lady Commodores with 20 points and 13 rebounds, while also registering 3 steals and 1 assist. Sain finished with 12 points, 8 rebounds, 2 steals, and a key block late in the game. LCCC is now 11-13 overall and 5-6 in conference games. Clark State falls to 7-14 and 2-9 in conference games. The Lady Commodores are on the road to face the Sinclair Community College Athletics at 1 p.m., Sunday February 10, 2019.